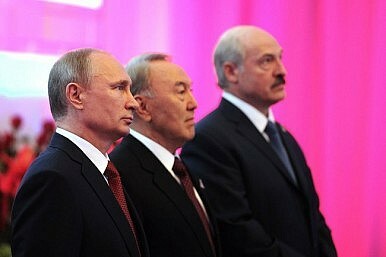 If you missed the official unveiling of the Eurasian Economic Union (EEU) on January 1, you weren’t alone. Instead of the pomp and circumstance requisite for the new “epoch” that Russian President Vladimir Putin claims we’ve just entered, the EEU came into being with thundering silence. And instead of heralding the dawn of a new “giant,” as Kremlin state media claimed, the EEU entered into force in a near-stillborn state. The reasons for the resounding disappointment surrounding the Eurasian Union’s unveiling are myriad, and have already been covered in stark detail within the Crossroads Asia vertical. The Eurasian Union was largely a non-starter as soon as Ukraine pulled out from the project, but its struggles have continued unabated. Belarus and Russia have yet to resolve their customs disputes – effectively nullifying the primary purpose of the customs union as a whole – and, in the days leading up to the EEU’s formalization, called Russia’s barring of certain Belarusian products “stupid and brainless.” Meanwhile, while customs struggles continue to separate Minsk and Moscow, it seems there will be no customs checkpoints between Armenia and Nagorno-Karabakh – despite the wishes of Kazakhstan, which had previously called out Yerevan for not securing its customs borders. That is to say, within the Eurasian Union, customs debacles continue between two of the founding members, but have been removed between one of the member states and an unrecognized statelet within a nation outside the EEU’s auspices. Not exactly the best way to build confidence in the organization’s efficacy. Astana, meanwhile, seems to be counting the weeks until it experiences its second devaluation in as many years. After 2014’s shock 19-percent devaluation of the Kazakhstani tenge, the country looks set for another imminent drop. The scale, according to analysts, could run from either 10 percent to 35 percent within the first quarter – retaining a bit of business that’s slipped toward Russia, but eating that much further into citizens’ savings. If you need any further proof, look again to the celebratory vacuum that greeted the Eurasian Union – not among observers, but among the member-states participating. Armenia’s president didn’t share a single mention of the Eurasian Union in his New Year address. And for the first time, Belarus opted not to carry Putin’s New Year greeting on its airwaves. So much for the welcoming of a new geopolitical pole. A new epoch may be among us, but no one seemed to notice.